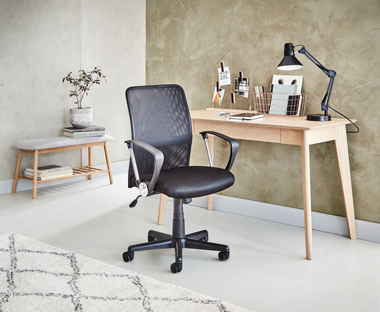 Whether you are working in an office or working from home, the environment must be styled to increase productivity – and that’s where JYSK can step in and create the perfect working environment you need to get your job done. Shop our collection of versatile and stylish office furniture to achieve the look you want that will help to get you in the zone for completing your tasks. Shop online and in-store for a great range of office furniture including stylish desks, desk chairs and chair mats to complete the look of your home office. At JYSK there is a selection of home office desks, computer workstations, laptop supports and office chairs – all of which are available at affordable prices. Whether you're shopping for wooden, metal or concrete desks we've got the option for you. If chair support is important to you then you're in the right place - we offer ergonomic chairs with lumbar support that will keep you seated in the correct posture for hours to prevent neck and back pain. The vast majority of our office furniture is flat-packed, so they are easy to transport to your workplace or home office. All items are designed to be put together in a simple and straightforward manner. Our office furniture also comes with clear and easy-to-follow instructions, so it won’t be long before you're ticking off you're to-do list with ease from one of our desks, whilst sitting comfortably on, and supported by, one of our chairs.